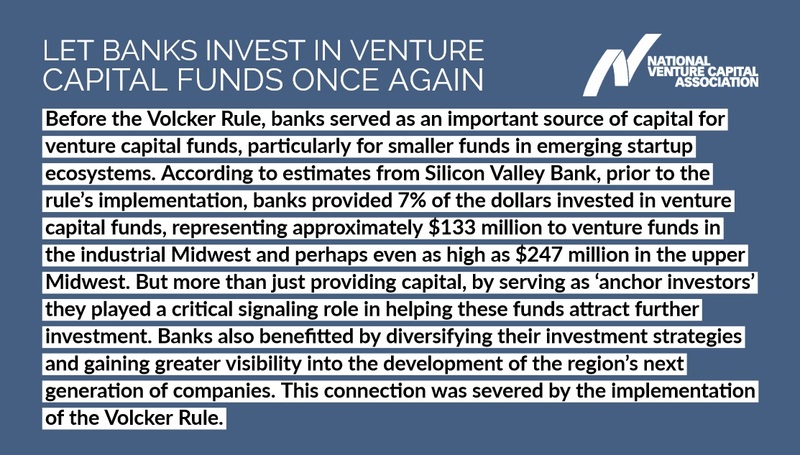 Before the Volcker Rule became the law of the land, banks served as an important source of capital for venture capital funds, particularly for smaller funds in emerging startup ecosystems. 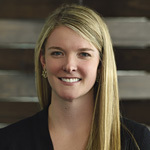 According to estimates from Silicon Valley Bank, prior to the rule’s implementation, banks provided 7% of the dollars invested in venture capital funds, representing approximately $133 million to venture funds in the industrial Midwest and perhaps even as high as $247 million in the upper Midwest. But more than just providing capital, by serving as ‘anchor investors’ they played a critical signaling role in helping these funds attract further investment. Banks also benefitted by diversifying their investment strategies and gaining greater visibility into the development of the region’s next generation of companies. This connection was severed by the implementation of the Volcker Rule. The decision to discourage capital formation is an unfortunate instance of regulatory overreach, and for the reasons outlined above, this decision has created a significant disadvantage for VC funds and entrepreneurs located outside of major traditional tech hubs. For perspective, if you remove the three most significant states for venture capital activity (CA, NY, MA), the median size venture capital fund in the U.S. is approximately $28 million, which can often be too small for large institutional investors to participate in a fund. Fortunately, the Federal Reserve Board and other regulatory agencies with joint jurisdiction over the Volcker Rule recognized the need for change when they launched a reform process and opened a comment period earlier this year. The base proposal sets forth a number of questions for consideration that drew our attention, specifically those that addressed fund characteristics to be acknowledged in changes to the definition of ‘covered fund’ and whether venture capital should be excluded from the definition. A broader solution that would create parity between permissible direct investment by banking entities and indirect investing by banking entities through funds. In other words, if banks can finance direct equity investments in startups, which qualifying banking entities are currently authorized to do, they should also be permitted to invest in funds that conduct similar activity. It is our hope that this reform process will allow the regulators to recognize the legal authority granted by Congress to revise the statute to more appropriately reflect congressional intent and concerns raised during the legislative process. As NVCA expands upon in our comments, the decision to include venture capital funds in the Volcker Rule does nothing to achieve the objectives of the legislation. Precisely as policymakers like Congressman Randy Hultgren (R-IL) and Senator Mike Crapo (R-ID) have recognized in recent months in support of NVCA’s proposal, regulators should seize this opportunity to support reforms that encourage access to capital and economic growth in areas of the country where it is needed most. Read NVCA’s full comments here. 156 Cong. Rec. S5904-S5905 (July 15, 2010) (colloquy between Senator Dodd and Senator Boxer stating that the statute’s prohibitions should not extend to venture capital funds).